It is another cold day on Beaty's Creek. My MIL is making dinner tonight but I still want to cook. I am making dessert, Apple Turnovers that is. 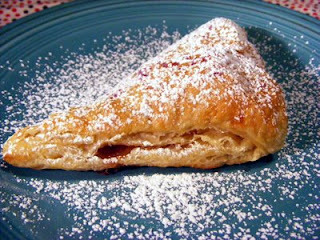 I love the way the puff pastry flakes as you bite into it and the way the apples and cinnamony syrup runs out. STOP!!! Will not eat them before dinner, will not eat them before dinner. I must keep saying this or they will be gone with a pot of strong coffee. Now let me tell you before I had 3 children I ALWAYS made my puff pastry and loved doing it, maybe loved is a little strong but I did like making it. Now I use the frozen puff pastry and think it tastes really good. So go ahead and give yourself a break and use frozen pastry with this recipe. Melt butter in skillet and add diced apples, sugar and cinnamon. Cook until apples are fork tender, this takes about 20 minutes over medium heat. Cool apples completely. When apples are cool unfold puff pastry and cut into quarters. Fill each quarter with 1/8 cup of apple filling, fold over and seal with water. Water will seal the pastry and keep filling inside. Cook in a 400' oven for 25 minutes or until golden brown. I baked mine on parchment paper to be safe. I hate cleaning up pie filling. As long as you seal the turnover they should not leak too bad. HOLY COW!!!! You can't do this to me.....I'm dying here!!!! Hey, how are you? Are you putting your favorites on here so you have them all in one place? I'm sending my mom over.....she LOVES apple turnovers!!! Have you tried the Pioneer Woman's apple dumplins? AMAZING....I'm sure you probably already knew about the recipe though...I don't think it is her original.